You should only need to create a starter once. You can keep it in the fridge for up to 6 weeks before it will lose its potency. Your starter is alive, teaming with microscopic organisms such as yeast and Lactobacillus. If you are making bread every week then you don’t need to feed the starter as the process of adding it to the sourdough and then removing the same amount after the sourdough has matured, is equivalent to feeding it. Place 100g of very ripe organic fruit and peel such as plum, fig, apple, pear or lilli pilli and 200g of filtered water in a clean plastic or glass container. 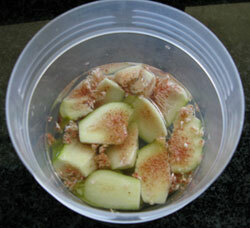 Wild yeasts naturally grow on the outside of fruits and always provide a great source for your starters. Make sure that the water covers the fruit and close with a lid to prevent drying. The ideal temperature is 20°C. Don’t worry about mould that may develop on the surface of exposed peel or fruit. Leave for 7 days. After 7 days mould will have formed on top of the liquid where the fruit has come into contact with the air, this is ok.
Strain the liquid using a kitchen sieve or squeezing through muslin into a container; it needs to be 200g. You can press the fruit with a spoon to get the required 200g of liquid. Next add 100g of baker’s flour. Mix them together and then replace the lid to keep the liquid from drying out. Ideal temperature is still 20°C. Leave to rest for 48 hours. After two days the mixture will have formed quite a lot of bubbles and may have a slight acetone kind of smell, that’s ok. The bacteria and yeasts are competing with each other for available resources in the mixture – since flour is the main source of food, those that are the most efficient at digesting the flour will gradually dominate the mix and other undesirable flora will gradually die off. Discard 100g of the current mixture and add another 100g of bakers flour, 60g filtered water and mix together to hydrate flour. Ideal temperature is still 20°C and leave to rest for 24 hours with lid still on container. Discard 100g of the mixture and add 100g of bakers flour, 60g filtered water and mix together to hydrate flour. Ideal temperature is still 20°C and leave to rest for 24 hours with lid still on container. You have created 420g of starter. 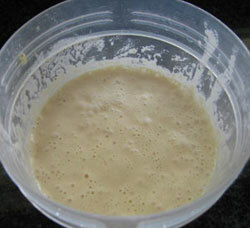 At this stage the starter should have the basic flora needed to successfully leaven the sourdough. However, depending on the specific conditions at your location, you may need to cycle the starter (i.e. 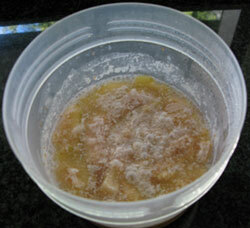 repeating step 4) to improve the quality and obtain the optimum mix of bacteria and yeasts. Using the starter to make bread has the same effect as cycling the starter, however you will be getting the benefits of a tasty loaf of bread at the same time. 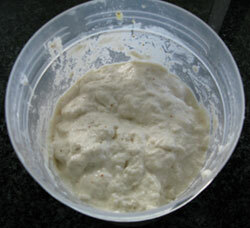 If the starter is not completely ready, that’s OK as the bread will still be fine, although a little heavy. If this is the case you can cycle the starter a couple more time before making the next loaf. The fermentation of the fruit encourages the ascendency of specific micro flora such as lactobacilli bacteria and those wild yeasts with a symbiotic relationship with the bacteria. The bacteria ferment sugars and starches and help produce the food supply for the yeast as well as the signature “twangy” flavour. By-products are metabolised by the yeast which produces carbon dioxide gas, which leavens the dough. This process is not the same as some so called sourdough breads which use additives to imitate the characteristic sour smell and flavour of traditional sourdough bread. In traditional sourdough bread, the bacteria and yeasts actually breakdown the flour converting it into components that the human digestive system is more attuned to and capable of absorbing. Modern breads that use additives to simulate traditional breads do not break down these components of flour and can lead to irritations and has been associated with the onset of gluten intolerance and coeliac disease. This starter can be stored in the refrigerator when not in use for up to 6 weeks. But it will lose potency as the 6 weeks approach. To rejuvenate the desirable micro flora and suppress the undesirable micro flora it will need cyclic feeding and be kept in a clean container. This can be done once a week. But if you are making bread once a week your starter will be added to the sourdough and then removed after the sourdough is complete – effectively cycling it once. It can be kept in the refrigerator each week with no further attention required.